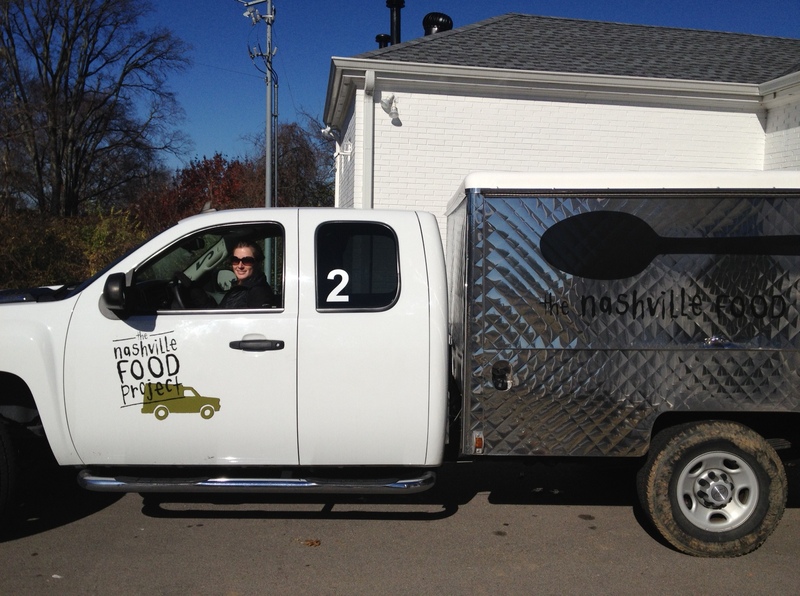 The Nashville Food Project is designed to create healthy food and deliver it by truck to the low income areas of Nashville to ensure that everyone regardless of their income has access to a nutritious meal. They food the turn out of that tiny kitchen is amazing – Like summer stir fry with beef or vegetarian lasagna. From the minute I walked into their offices I was hooked! There was fresh produce on every shelf and everything was incredibly well organized. It was clear that the team had fully embraced the idea of providing a rewarding and seamless experience for their volunteers. 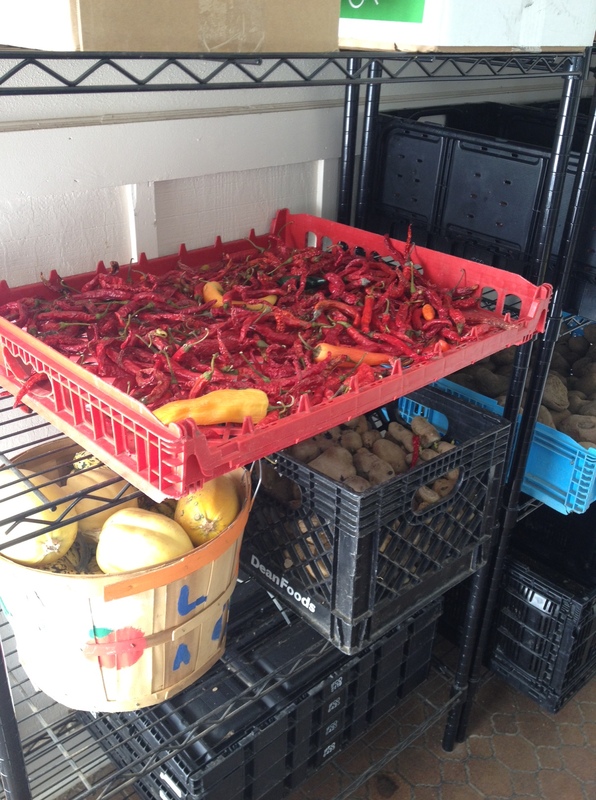 After a couple times of volunteering, one of the project leaders suggested that I look into becoming a volunteer leader myself so that the Nashville Food Project in cooperation with Hands on Nashville could offer more meals each month. After a little arm twisting (ok definitely no arm twisting required), I signed up to run the project on the fourth Sunday of every month for six months. Two months in, I moved back to Memphis, but I love the project so much that I continue to drive to Nashville each month to work with the project. If my count is correct, Day of Mission Memphis marks my fifth time to lead a group for the Nashville Food Project. About 70-80% of the food served is hot (like the veggie lasagna mentioned above), but on the weekend shifts stick to sandwiches and fruit. Shortly after I get there, the volunteers start to show up to prep the sandwiches for the trip, which usually involves making 60-80 turkey sandwiches. One of the volunteers, Brittany is there consistently each time I’m working, despite that fact that she was working two jobs and putting herself through school. 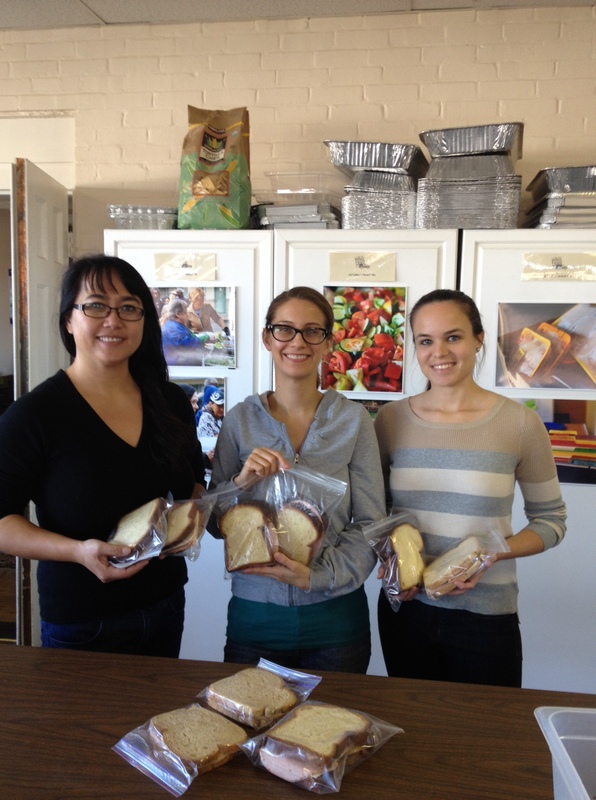 While you can’t see all the sandwiches in this picture, the wonderful volunteers assembled 60 sandwiches for the delivery. Generally, I experience a volunteer opportunity from the perspective of the volunteer, rather than the volunteer coordinator. This project is one of the few instances where I feel like the volunteer experience is up to me – that it’s my responsibility to make sure that each volunteer feels valued and appreciated. It always makes me a little nervous because I put a lot of pressure on myself to provide a meaningful experience. It’s nerve racking because you never know who is going to show up (or if they’re going to show up), and most of the people I interact with are new to the project. 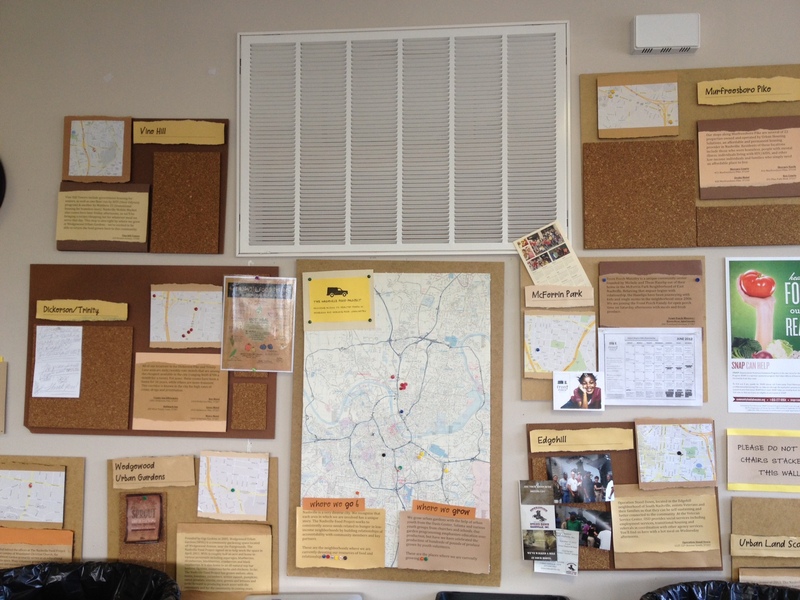 When we get new volunteers, I make an effort to point the map wall (as I call it), which highlights the different areas served by the project and includes a brief description of each location. 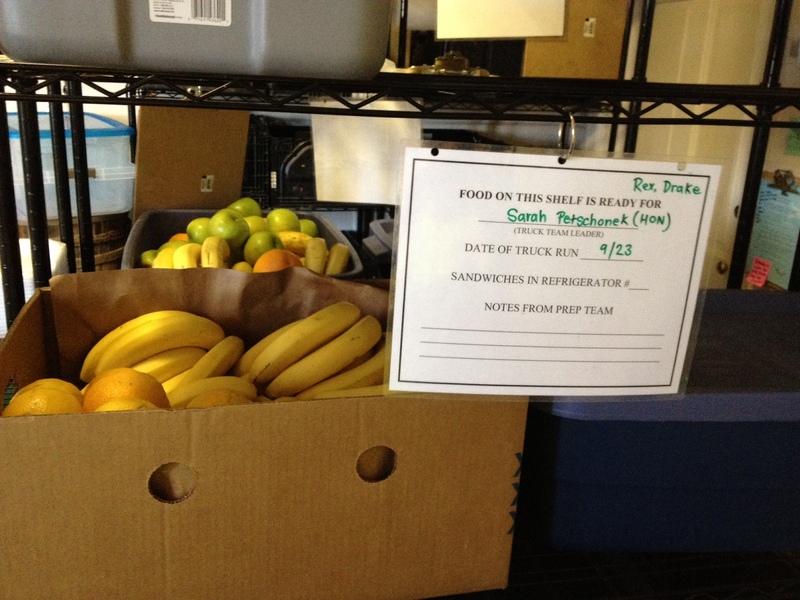 After prepping the sandwiches and covering the basics, we grab the fruit, hardboiled eggs and any special produce and load up one of the two trucks for delivery. Once we get to the site, we’ll set up and assembly line to hand out the food, which on this run included turkey sandwiches, string cheese, apples and oranges, and hardboiled eggs. Volunteer! There are daytime, weeknight, and weekend volunteer opportunities with this amazing project. You can cook, garden, prep, deliver or any combination of these activities. 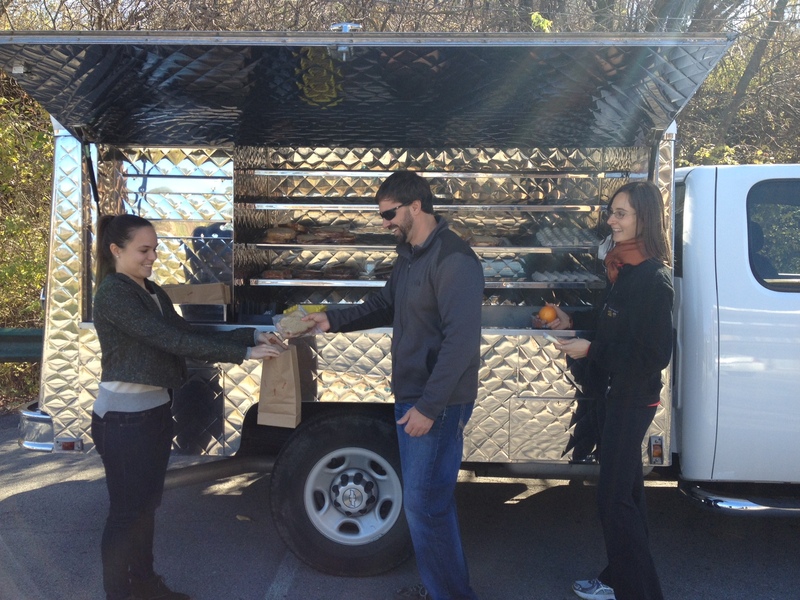 For more information about volunteering, check the Hands on Nashville calendar or contact The Nashville Food Project’s volunteer coordinator Nathan Dryden at nathan@thenashvillefoodproject.org. Donate! Every little bit helps and they can stretch your dollar a long way!